I’ve been volunteering for the African Child Trust for close to 18-months. 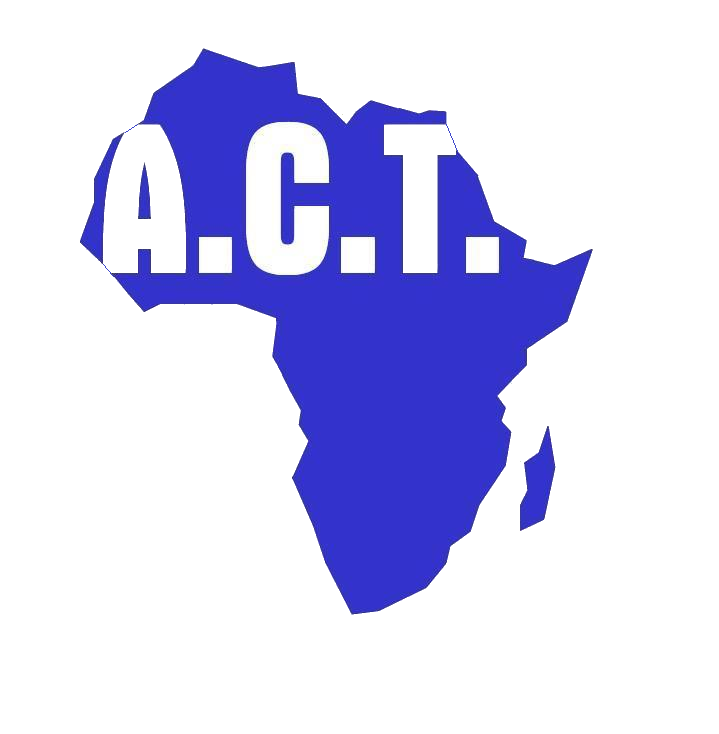 Helping to build the website, post the blog articles and manage the social media has been a very rewarding experience – but managing everything from the UK left me eager to see more about the impact of ACT first-hand. Hearing that ACT director Dr Kunle Onabolu was planning a trip to Nigeria felt like the perfect opportunity to do so! 2-days later I had paid for my own flights and vaccinations – and was facing up to the excitement of my first trip with ACT and first time in sub-Saharan Africa! When mentioning to family and friends about my trip – the reaction tended to converge upon one of intrigue and concern for my safety. Good news usually does not make a good press story and often the image of Nigeria has been painted negatively. My own feelings were one of excitement, intrigue and anticipation! Meeting Kunle at 8am on Tuesday Morning in Heathrow Airport spelled the start of the trip! Fresh, excited and ready to go! The first piece of good news….we’d been upgraded! 6-and-a-half hours later we were landing in Lagos Murtala Mohammed Airport and my first view of Nigeria! How did I feel? Hot…it’s so hot! We had swapped the single digit Celsius reading in London to 30’s in Lagos. Getting into the air-conditioned taxi was a welcome comfort – before the next challenge….navigating the roads of Lagos! The roads were packed with the iconic yellow buses, fast lane, changing motorists and a unanimous liberal use of the horn! 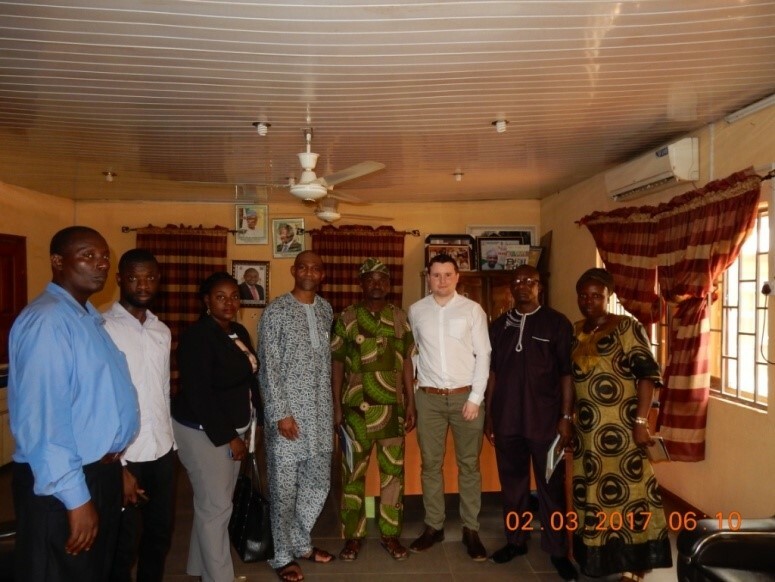 Over the course of the next few days we had a number of interesting meetings which had been set up for us in advance by ACT (Nigeria) Project Officer Yetunde. These included the District Governor of the Rotary Club International District 9110, Pat Ikheloa; Lagos State House of Assembly representative for Alimosho constituency, Hon. Bisi Yusuf and Sole Administrator for Ayobo-Ipaja local government, Hon. Abiodun Agbaje. I was uncertain whether the meetings were purely for pleasantries or if there were specific motives. However, coming out of the meetings, the feeling was absolutely clear – the work ACT has been doing in the community and its success hasn’t gone unnoticed and is in fact being recognised at all levels! Rotary Club International is particularly supportive, going above and beyond to establish an on-going partnership that will support ACT in Ipaja year on year for the foreseeable future! 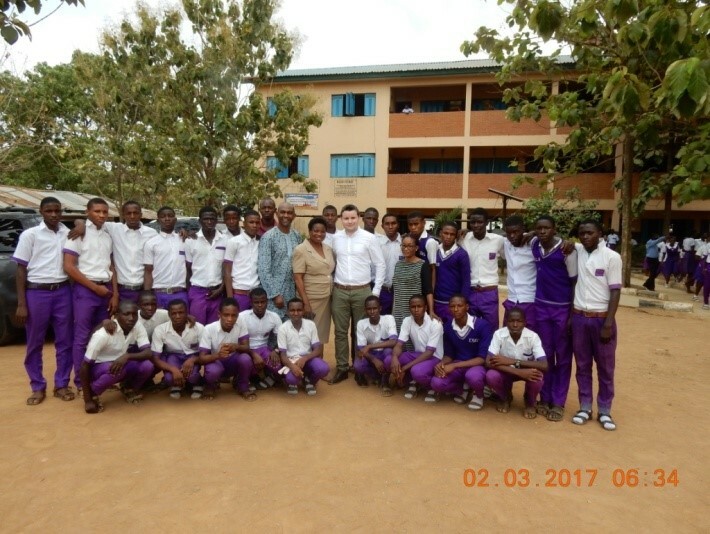 Our visit to three secondary schools in Ipaja, which are attended by many of the disadvantaged children and orphans that ACT support was full of fun and excitement, but also instructive. Situated on the same complex were Ipaja Community Junior Secondary School, Ipaja Junior College and Ipaja Community Senior Secondary School. Discussions with the Principals of each of these schools all came to the same conclusion – firstly that the ACT supported children were doing very well and were very motivated to learn – and secondly, that there were many more children also with similar degree of need for support. This gave us much to think about for future ACT projects and support. The visits were very motivational. Most satisfying were the responses given by ACT kids when asked “What do you want to do when you’re older?” Answers ranged from lawyers to bankers to artists. What was very clear is that with the support of ACT, the children had not only been given the opportunity to school and become educated, but they had been given ambition to thrive! The only part I was not prepared for was the great interest the kids had in meeting me an “oyinbo”-white man! They gave me an unbelievable welcome! 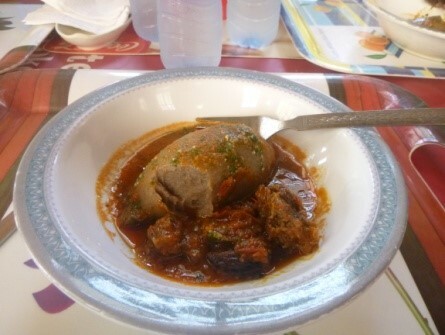 I promised myself that I would jump into the deep end – so taking off the table anything which wasn’t traditional Nigerian cuisine. And sure were there lots of opportunities! The verdict: Extremely spicy! Filling and often very tasty! Despite this, I wasn’t eager to take the recipes home with me – but very pleased to have tried (and finished) everything put in front of me! On Saturday 4th March, we held our long awaited charity event. 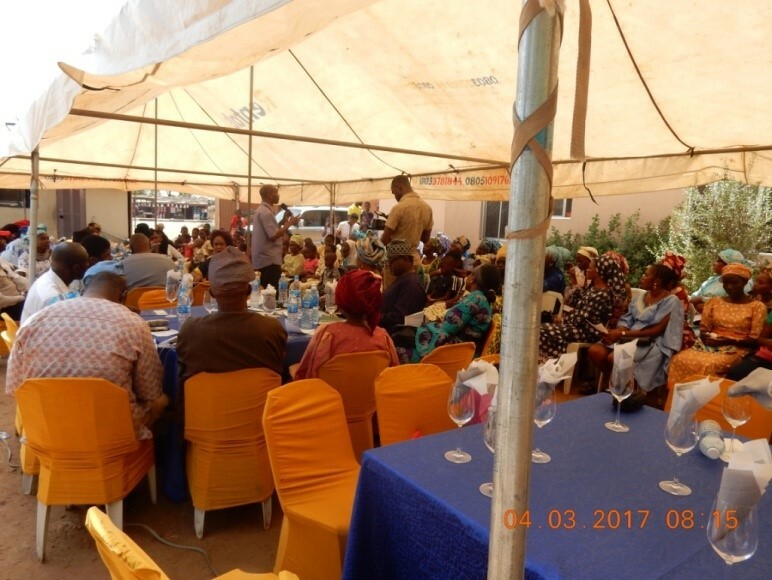 It was an occasion for celebration, bringing together the forty seven (47) children that ACT currently support in the Ipaja community, widows, grandparents (carers), and stakeholders in the community, sponsors, invited guests and friends. The day was packed with rehearsed songs, dramas performed by the kids, speeches, including those by Kunle, myself, Pat Ikheloa (Rotary District Governor) and Tony Osibodu (Corporate Messengers). I was also given an extended lesson of African dance moves – something which the kids took great delight in watching me try and fail to find my rhythm! The most heart-warming part of the day for me was a section entitled “Testimony” – where several of the children and widows, voluntarily and often spontaneously, decided to take the microphone and express the impact of ACT upon them. Phrases such as “I’ve been rescued by ACT” and “ACT has given me hope for the future”, really emphasised how immensely grateful the kids and widows are for the opportunities given. By Sunday evening, the trip was over! Wow that went fast! I left with lots of wonderful memories. Our flight landed at 5am on Monday morning – and we were back to the normality of London (and back to the day-job for me!). I left with great pride at the work which ACT has already achieved and a burning ambition to do more and see further success. 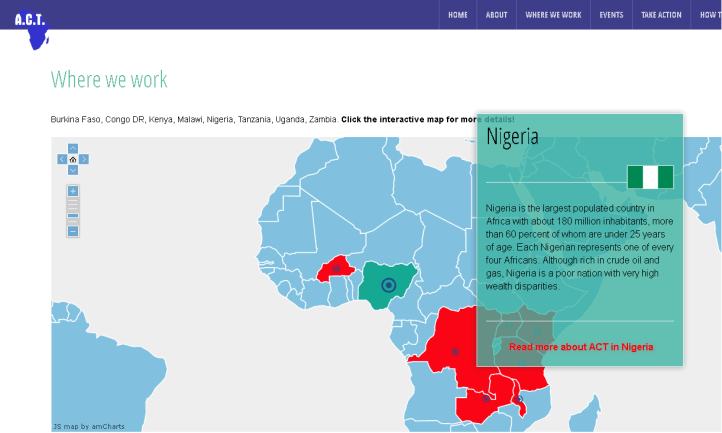 Find out more about ACT’s work in Nigeria by clicking here. Find out more about how you can sponsor a child or donate to an ACT project. Jack Beadle is a hedge fund trader working in London. He started volunteering for ACT in October 2015 as communications & marketing officer.